ORIGINALLY PUBLISHED ON THE MARSH VOCATION BLOG, A PUBLICATION BY THE INTERNS IN THE MARSH ASSOCIATE INTERNSHIP PROGRAM AT BOSTON UNIVERSITY’S MARCH CHAPEL. As I sit here in front of my computer, typing quickly before I head off to the slew of Easter services that Marsh Chapel is holding this morning, I think about all the things Easter has meant to me. I’m wearing a new dress now, as always, because that was a constant in our family–my mom was adamant on having a new set of clothes to wear for Easter morning (I didn’t get it then, but now I suppose it was one of her small ways of symbolizing new life and a fresh start; back then, I was just excited to get a new fluffy pastel dress). My dad would also buy all his girls–my mother, my sister, and me–fresh lily corsages, tied in ribbons around our wrists. In my South Carolina hometown, it would be azalea season, and we would always get pictures in front of the vibrant, delicate magenta flowers. In the mornings before church, we would find our Easter baskets, hidden craftily around the house in places like the inside of the oven or behind the door of the washing machine. After church, we would hunt Easter eggs while Easter dinner cooked, crowing in triumph when one of us found the “golden” egg (so called because it had a $5 bill inside of it, instead of small change, like the others). My Easter memories aren’t really about religion. Most of what I remember about Easter church services are lilies at the front and purple on the altar. At one of our churches, there was always a cross made of flowers put out front on Easter Sunday, and after church, they let the children pluck flowers from it to take home. Now that I’m older–and studying religion, and working at Marsh Chapel–I have to put more thought into Easter. It can’t just be a holiday where I go and sing some hymns and then sit down to a family dinner of honey ham. I have the think about it theologically. And, as a Unitarian, that can be tricky. 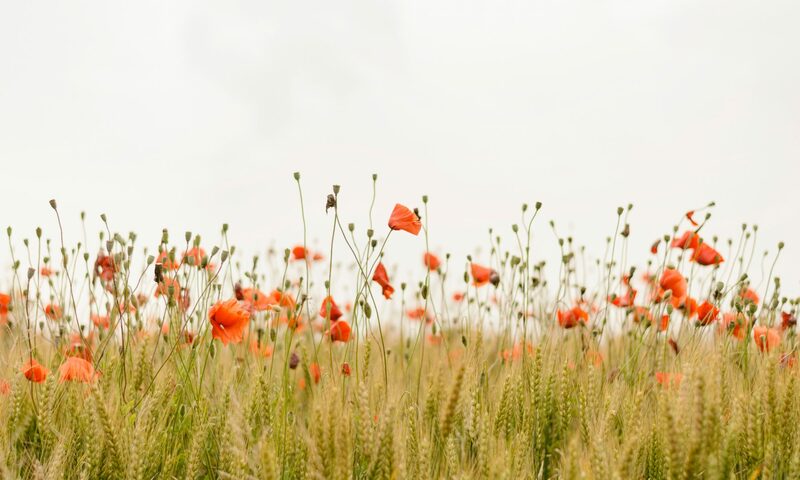 Easter is a holiday I love for all the fond memories, and for its themes–rebirth, new life, fresh beginnings (it’s no coincidence that it happens at the start of spring). But I was struggling with how to fit all the triumphant talk about victory over the grave and the Resurrection, which my own personal theology…well…doesn’t affirm. I think this is beautiful. The idea that love is our legacy. 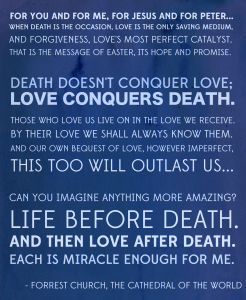 That the story of the Resurrection is a metaphor for the transcendence of love over death. It is something I can get behind. And it is what I will be thinking about when I sing, “Christ is Risen” in church today.